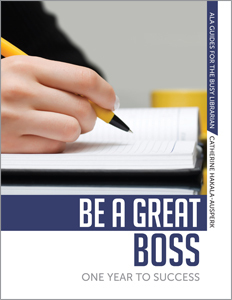 Catherine Hakala-Ausperk is the author of Be a Great Boss: One Year to Success. As an adjunct faculty member at Kent State University’s School of Library and Information Science, I start each semester by telling students in my Management class that, when I took this course back in the 80s, the professor began by asking us “Who wants to be a manager?” Only a few of us tentatively raised our hands, fearing the wrath of our peers either because of our ambition or our foolishness at dreaming so big. Everyone else was there because it was a core class.